Consider the stresses exerted on your Boler frame as you travel down highways, hit bumps, swerve around pot holes and experience wind forces equal to a hurricane. Like the foundation of your home the frame and axle keep every part of your Boler body straight, square and stable. 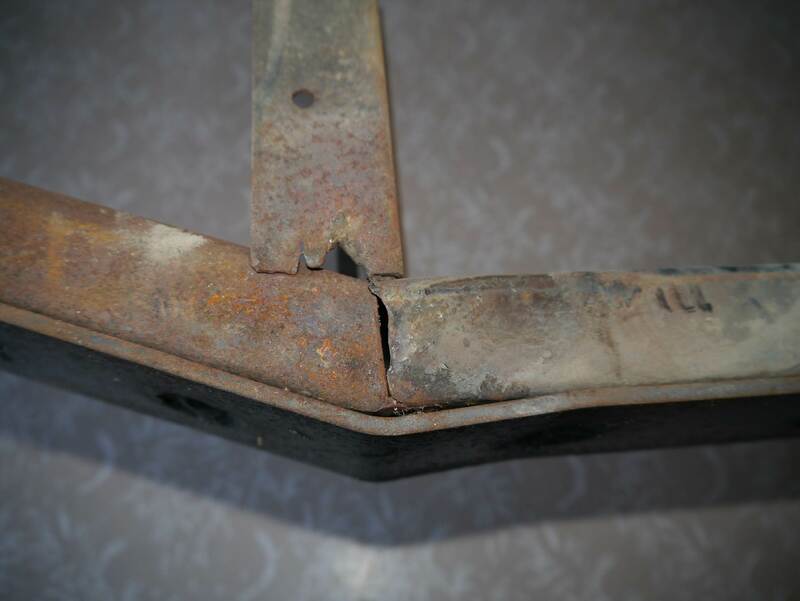 Many problems seen throughout a Boler can be traced back to a bent, twisted or broken frame. The frame can be considered a problem area or weak point with the Boler, but let’s start with the original concept and design. With the fiberglass body mounted securely to the frame the combined integral strength is considerably higher than each component (body & frame) separate. The frame was built with overall weight a prime consideration, the initial frames built in 1968 & ‘69 used 1.5”x3” 0.083”/0.109” or 12/14 gauge “C” channel. From 1970 and onward a rectangular box section frame was used made from 1.5”x3”, 0.0625” or 16 gauge rectangular tube, this entire frame with axle and wheels weighed 300 lbs. Problems with the design of the Boler frame contributes to the structural issues commonly seen on the 13’ Boler. The right hand frame rail (curb side) is cut or notched to accommodate the lower kitchen floor and the doorway, a small angle iron or 2”x2” square tube is welded under the doorway to carry the load, but because of the reduced size and strength this area is prone to flexing this greatly compromises the strength and load capacity of that member. Compounding the above is the design of the tongue. Boler used a narrow 30 degree tongue angle (50 degree tongue angle is now the industry standard), this made the tongue length longer and resulted in the angled tongue members joining to the frame under the body on the right hand side right where that rail in notched for the doorway. The pictures to the right show typical examples of repairs to the left front frame rail which has broken or cracked due to flexing of the frame caused by the bolts holding the body to the frame becoming loose. Without the body helping to support the frame, the frame will start flexing on the right hand side where the frame is notched by the door and the tongue joins. Although you would think the flexing in this area would cause cracking or a break this seldom happens on the right hand side. Actually this flexing causes higher stress loads to be transferred to the opposite frame rail (the left or drivers side) where cracks and breaks to that rail where the angled tongue joins the side rail are common. With the body essentially riding loose on the frame every time you accelerate the body will rock backwards. When this happens again the weaker right hand frame rail will flex which again transfers all the load and stresses to the left hand rail but this time all this load is concentrated towards the rear of the left hand rail, from the axle to the back bumper. It is very common to look down the left frame rail from the back bumper and actually see that frame rail bent down from the axle mount to the rear.These pictures show a typical Boler frame that the left frame rail has been bent due to the body bolts being loose, The red line shows how much this frame has bent down, from the axle to the rear bumper. In either of the above cases the misalignment of the frame will cause the body to twist, this usually shows up at the doorway where the upper right corner will crack, the leading edge of the door frame will drop making it look like the top of the door frame is angled (which it is), and twisting of the kitchen cabinet and dimpling of the outside body above the left wheel arch. Because it is critical that the frame is level any repairs done on any part of your Boler should start by ensuring that the frame rails are level to each other and straight. If cracks in the frame have been repaired using steel plates to bridge the cracked or broken area keep an eye on the surrounding area on each side of the repaired section. Unless the cause of the cracking, the loose body bolts, are repaired the stresses will still be transferred to the left rail and new cracks will develop at the next weakest point of that frame, usually right next to the patch. Removing & Reinstalling Body on Frame Removing the Boler body from the frame is actually quite easy, but throughout this process remember you are working with heavy items that react very quickly and unexpectedly to gravity. They will fall and can cause a lot of damage and injury so proceed with caution and always consider your personal safety. You may be thinking at this point there is not a lot holding the body to the frame and you would be correct, a common problem I have seen on Boler’s are the mounting bolts pulling loose which will allow the body to “rock” on the frame. This rocking will usually cause the left frame rail (drivers side) to bend downward from the axle location to the rear bumper. If you look down the left frame rail from the back and notice an arch or downward bend that is the cause. NOTE: any time you are lifting or supporting the body on the fiberglass floor always use 2″x6″x12″ long pieces on wood between the jack and/or stands and the floor of the Boler to distribute the load over a larger area. NEVER support the body by the edge of the body. With the frame now sitting on the ground and the body supported by jack stands the job is not finished, you will notice the locations of the jack stands prevent the frame from being removed from under the body. The next step is to slightly lift the body and support it on 4″x4″ timbers that are set on jack stands positioned outside the frame. To do this lift each end of the body slightly with the jack, leaving the first set of jack stands in place for safety, position the 4″x4″ timber across under the body. Use a stack of lumber between the top of the timber and the floor of the body. Make sure the edges of the body do not rest on the sides of the body that overhang the floor. Once the timber and blocking are in position and stable, the original jack stands can be removed and that end of the body can be slowly lowered onto the timber and blocking. Repeat this process for the other end, the frame can now be removed by sliding the frame out from the front.